We are taking a short break (until April 16 2019) in taking new orders while we sort a few issues without production workshop. Please do not hesitate to contact us if you have any questions. After a year of additional research and development and a 6 month pause in production to “get it right”, the 800N jackets are now available to order. 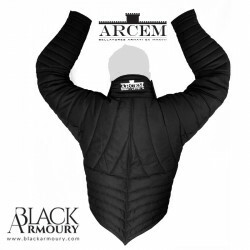 The ARCEM range of jackets focuses on two things - maximum mobility and maximum throat and neck protection. 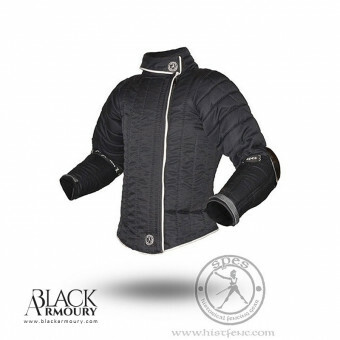 The mobility is achieved through precise contoured stitching of the shoulders and back, allowing the padded jacket to move freely with the wearer. This mobility is accentuated by close-fitting forearms, which, with the collar system, “tie” the jacket to the wearer at three points (forearms and neck) with the rest of the jacket slightly “floating” around the body. 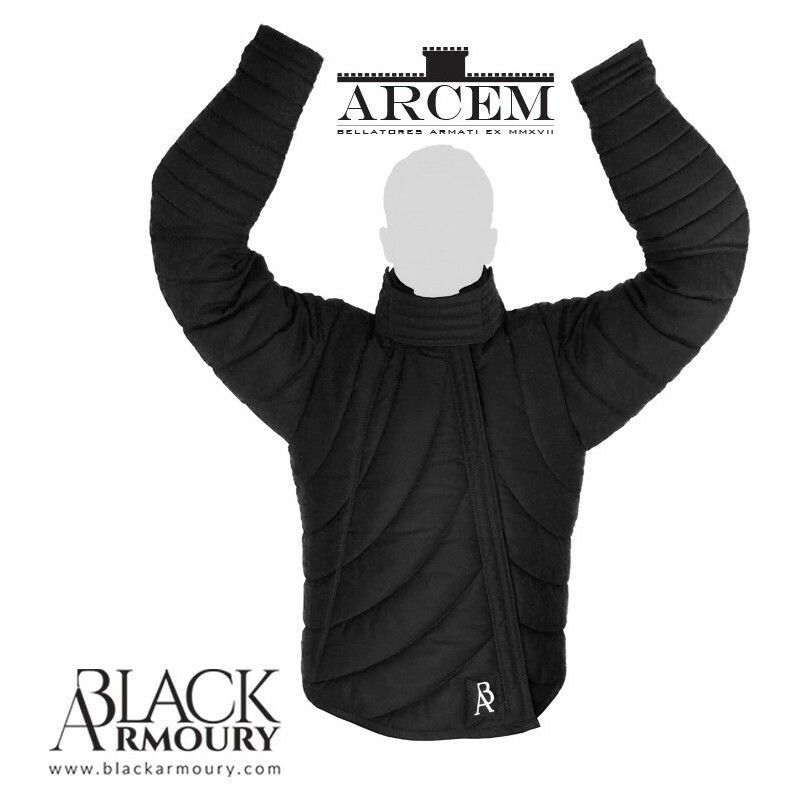 This solution - while inspired by examples of fit and assembly found in XIVth century pourpoints - is still unique in contemporary HEMA clothing. 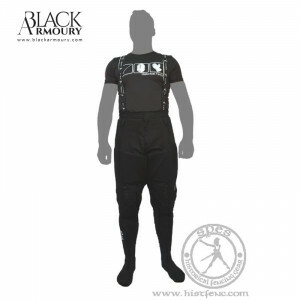 Our most unique contribution (now copied but never matched) is the collar, which is designed to close over the mask bib. that it unify the mask and jacket into a single protective unit without hindering combat movement (once broken in). 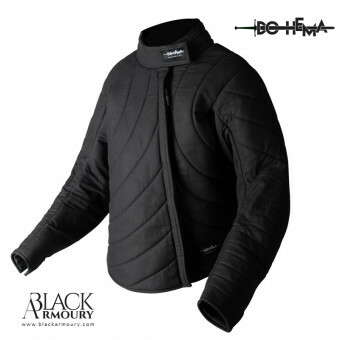 Because it is worn outside the mask gives double protection from thrusts to the front - collar plus mask bib. 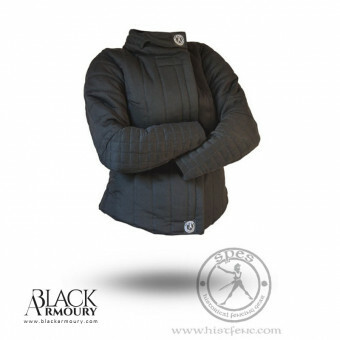 More uniquely, and not present on competing over-bib collars, it provides protection of the neck, all around, from strikes. The collar has three blade catchers (front and both sides) that extend to behind the ears. 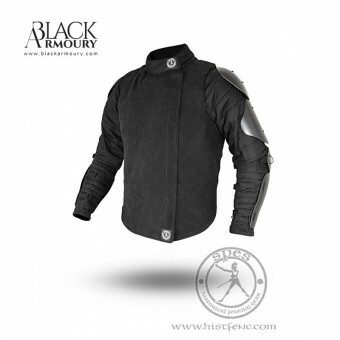 It is designed so that the blade passage inside the jacket at the neck must strike the mask or be moving away from the body. The collar can be opened to let off heat and raise the mask. 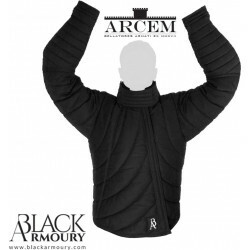 With just a little practise, it is a simple matter to re-close the collar, even with heavy combat gloves. 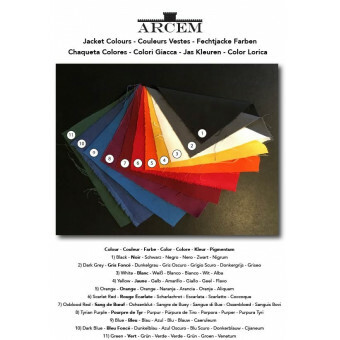 You can find our Size Chart and Measuring Instructions in the DOWLOAD tab above. Our standard sizes are numbered 0 to 4. Fully custom sizing is also available for a cost of 40€. Contact us for details. 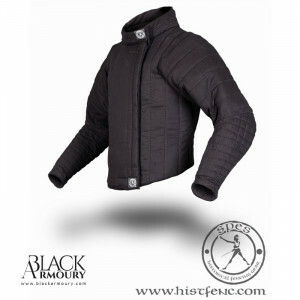 Our jacket however fits differently to other jackets, so it’s best to retake your measurements from our chart. Our basic colour is black.